Set your Impala apart from the rest! 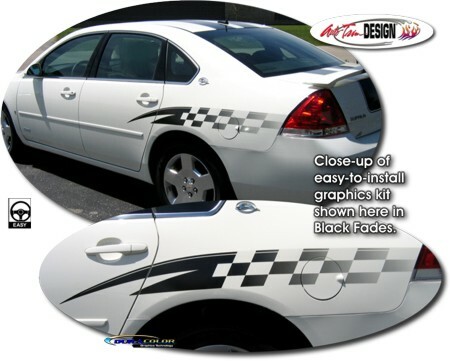 These "Racy" body side graphics are designed to fit perfectly on your Impala's Rear Quarter areas as shown (designed to be installed along body line). Utilizing unique fade patterns, graphics start solid at the front and gently fade to the rear. Available in four (4) Fade colors (Black Fades shown). Very easy to install (trimming required at door jambs and fuel door opening) and will fit any '06-Current Chevrolet Impala.